At the Toronto Bike Show Canadian Cyclist teamed up with Café Domestique to offer great coffee to show attendees. CD's Krys Hines spent 3 full days squeezing the beans for a good cause, raising $$ for the Forest City Velodrome (FCV). Through the sale of beans and merchandise, combined with donations for shots, 500$ was raised. 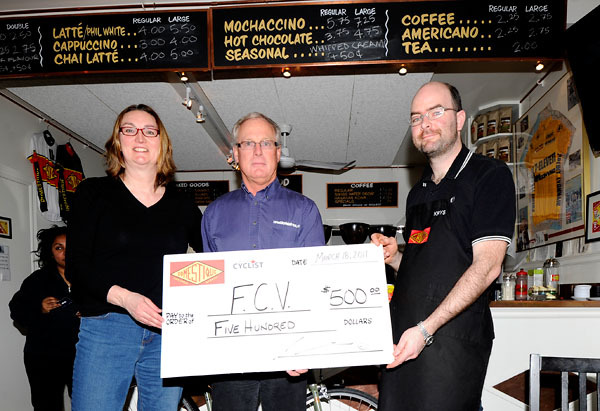 On Friday March 18th CC and FCV's Rob Good met up at at Café Domestique where Kry Hines handed over the funds. Thanks to everyone who dropped by at the Bike show and made this possible.